The Padded Crescent Bar Stool Grey is the latest addition to our universally praised collection, uniting all of the design aspects that make the Crescent range so popular. Acquaint yourself with the allure of a truly chic furnishing and invest in a Padded Crescent Bar Stool Grey. The substantial, moon-shaped seat creates a gentle sitting experience, exuding a fiendishly funky vibe. As grey is a colour that sets every room alight with sophistication, we're confident that the Padded Crescent Bar Stool Grey will increase the beauty of every setting. As padded in nature as it is in name, the Padded Crescent Bar Stool Grey is destined to comfort you through the years. The chrome metalwork produces an eye-catching, glossy effect while the horseshoe-shaped footrest effuses comfortable charm. 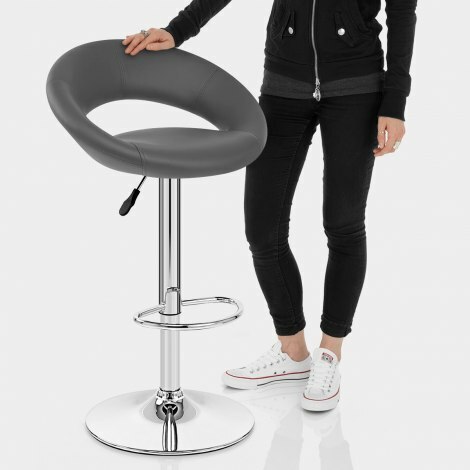 Integrating a variable height mechanism and 360-degree swivel, the stool can be customised in accordance with your needs. 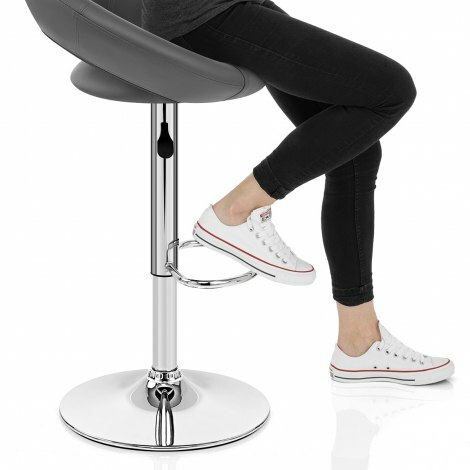 Operating as a stool that suits all circumstances, it even includes a protective rubber ring on the rim of the base, protecting your floor from marks or scratches. "Great value and good quality. Easy to assemble too"
I found the delivery excellant and the quality for the price very good. Great service, excellent value for money. Very pleased with bar stool. Delivered on time. Would recommend. We were very pleased with the bar stools and thought they were a very good price. We were impressed with the delivery of them the next day and the offer to collect them had we not been satisfied. I shall definitely recommended your company.